Hi there, my darlings! 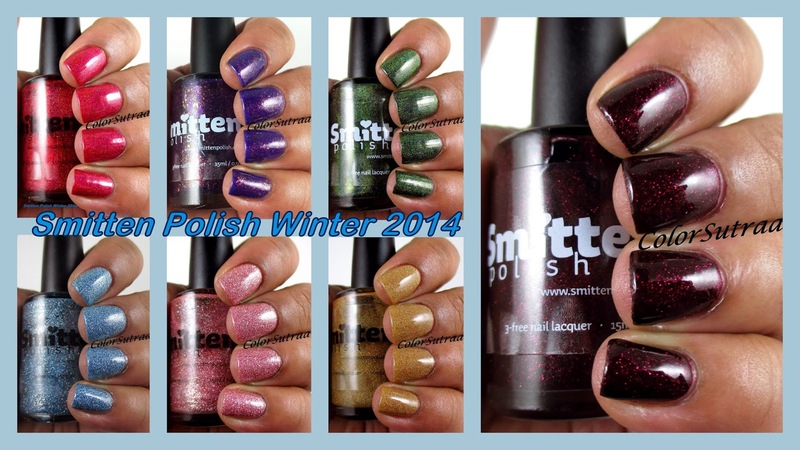 This afternoon, along with my much-delayed swatches of the Summer 2014 collection, I also have more seasonally appropriate swatches of Smitten Polish's Winter 2014! And this is one gorgeous collection! Before we get to swatches, let's quickly discuss the formula and application of these polishes. Across the board, just like the Summer collection preceding this, whether a holo or microglitter, these polishes applied fabulously--smooth and even. No patchiness or streakiness and full opacity at 2 coats, although I used 3 coats, unless mentioned otherwise, for greater depth and vibrancy. The holos are 3 thin coats on their own and the microglitters were topped with 2 thin coats of G&G's HK Girl topcoat. With that, on to swatches! Between the Baubles is a deep forest green with a linear holographic finish. Very appropriately named since this reminds me nothing so much as the Christmas tree! 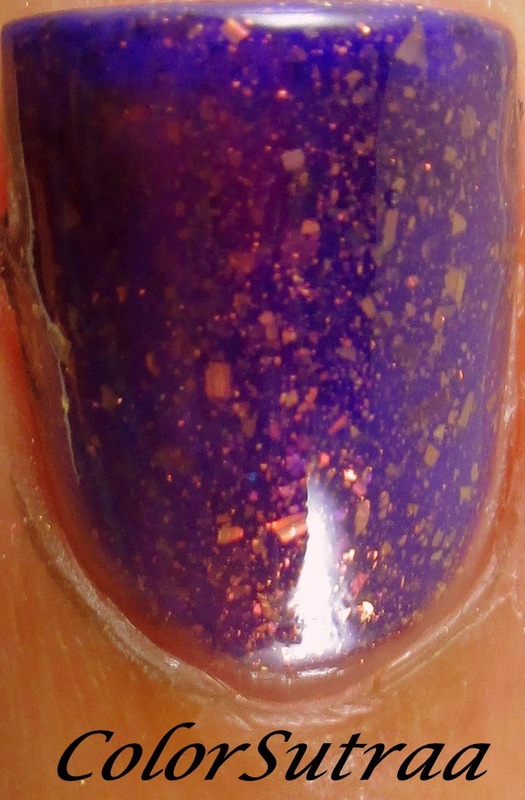 Figgy Pudding is a vibrant purple jelly full of bronze flakies and added shimmer. Oh how I adore this polish! If you're a fan of Max Factor's Fantasy Fire, this is its flakie cousin! 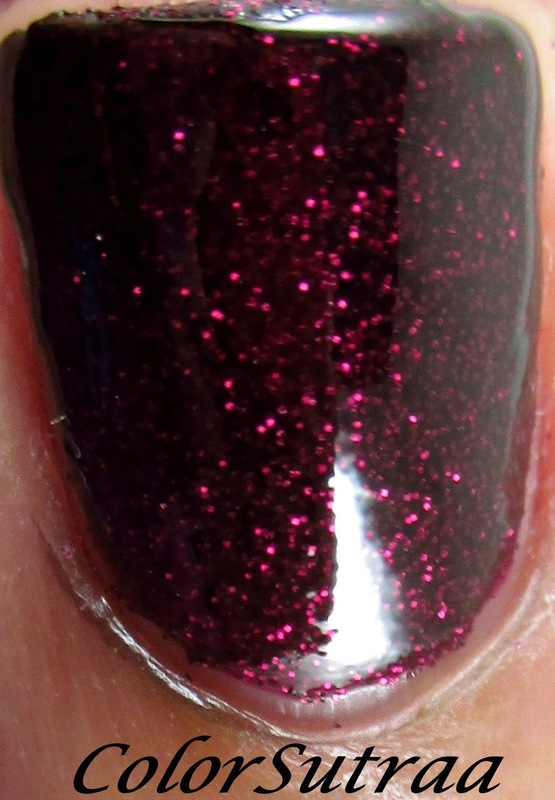 Figgy Pudding is a vampy burgundy jelly full of red microglitter. This polish all but glows and is one of my favorites in this collection! Jack Frost is a icy blue jelly full of holographic microglitter. So perfect for Winter! Nose So Bright is a true red with a linear holographic finish. My camera picked up a hint of magenta/dark pink undertone but this is as true a red in real life as I've ever come across! So, so beautiful! Maple Sugar Candy is a antique gold jelly full of holographic microglitter. Such an elusive color to capture! Snow Day Sunrise is a medium pink jelly full of holographic microglitter. So pretty and feminine! So there you have it, my darlings! This collection is currently available in Noelie's store HERE for the price of $11.50 for a full-size, 0.5 oz holo and $9.50 for a full-size, 0.5 oz microglitter polish! You can also follow Smitten Polish's Facebook page for the latest information, including exact times in your time zone!.Look her up on Instagram to see swatches by Noelie herself! Which of these do you love best? Tell me all about it in the comments section below!